More fun than a Happy Meal! 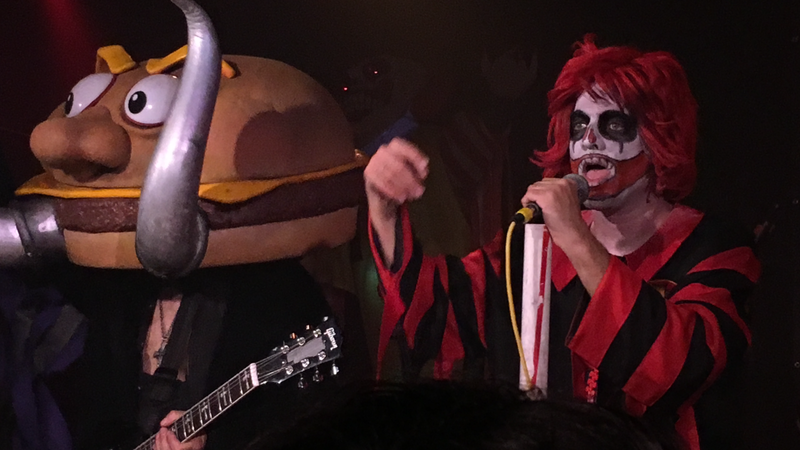 Wednesday night at Underground Arts, Mac Sabbath, the self-proclaimed “forefathers of Drive Thru Metal,” performed a demented set of their corporate fast-food parody-rock in front of laughing, head-banging fans. After a lengthy session by opener DJ, and local musicians and artist, Perry Shall, the lights dimmed and the speakers crackled with a crooning version of Send in the Clowns. The smell of french fries wafted through the air as the remixed Sondheim classic slowly disintegrated into mayhem. The massive red and yellow curtain dropped to reveal the set as a maniacal fun house, complete with giant carnival clown faces shooting lasers out of their eyes. 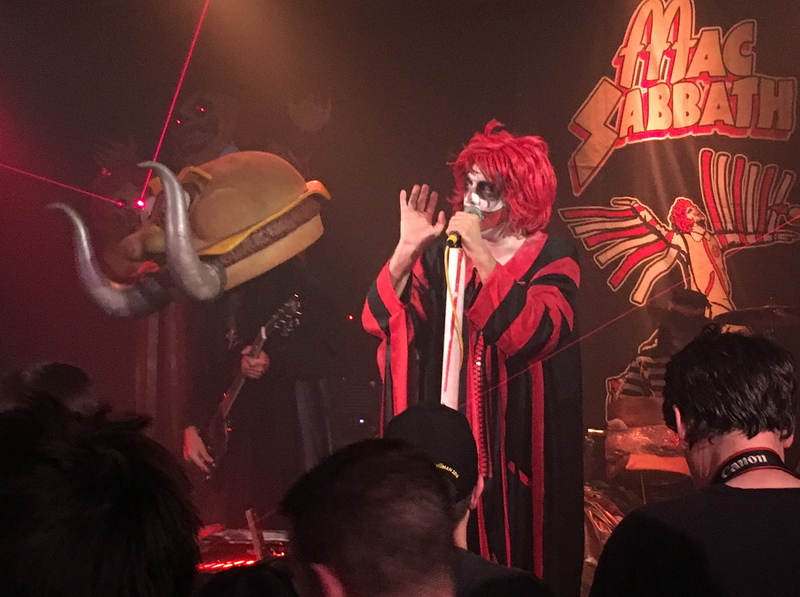 The Mac Sabbath logo consisted of the image of Ronald Osbourne chasing a flying bat on a hamburger bun. Setting the table for the fast food feast ahead, Ronald Osbourne first appeared on stage in a straight jacket. Although his face was painted like a horror movie version of Ronald McDonald, the charismatic lead singer displayed all the flair and showmanship of Ozzy Osbourne. Ronald’s red hair flailed about as he wrestled with the straight jacket, psychotically laughing and observing the crowd with a badass stare that would surely make Ozzy proud and the McDonald’s P.R. team fume. On stage right, Slayer MacCheeze wailed on his guitar, his giant cheeseburger head adorned with giant horns. On stage left, the giant Grimalice played on bass, his costume inspired by the purple anthropomorphic cartoon character from the fast food commercials of the seventies. Keeping beat on drums was the prison-striped Catburglar, also referred to as Peter Criss-Cut Fries, his face painted just like the Kiss drummer. Even the drums were costumed to look like giant Bic Macs. The band is actually really good, covering Black Sabbath tunes in a manner that is sure to please classic metalheads, surely not an easy task for the guitar and bass players performing in oversized costumes. Ronald occasionally chatted in his British Ozzy accent with the crowd, exclaiming Philly “gets us” because we’re a foodie town that loves cheesesteaks. It was evident that underneath his painted face, Ronald cherished his delicious task of portraying the evil corporate clown. His banter was chock-full of atrocious puns, such as when he exclaimed fast-food bands are a new genre, with upcoming bands such as Almond Joy Division and Cinna-Bon Jovi. The fun house visuals, the elaborate set and costumes, combined with Ronald’s dead-on Ozzy impression in clown makeup, his evil laugh and bad puns had the crowd alternately staring in disbelief, laughing, and rocking out. 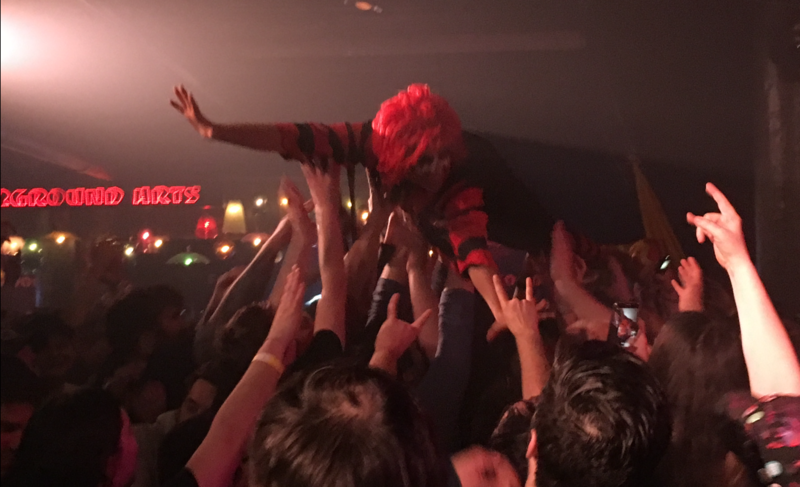 Check out the video below to see Mac Sabbath performing Frying Pan. This entry was posted in Rock, Show Review and tagged Black Sabbath, featured, Mac Sabbath, Mcdonalds, metal, underground arts. Bookmark the permalink.